You won’t find any of the beauty and special experiences of a France Passion site at an Aires de Service. Rather, these are their poor cousins, aesthetically speaking. However, they do have a place in the world of motorhome and campervan travel in France and throughout Europe. Aires de Service are the official free campervan stops in France and have come in handy on more than one occasion on our travels. What is an Aires de Service? The word means an area of service. Simply, they are areas that have been set aside for motorhome and campervan travellers to either use the services (water, electricity and waste disposal) or to stay overnight. Not all “aires” allow overnight stopovers, but quite a few do. Aires can be found all over France (and other countries) and usually appear in small towns, where local municipal councils are responsible for their upkeep. It is a way of enticing travellers into their communities with the hope that they will spend some money locally. I know we do as being able to find somewhere safe to park has its advantages. They are usually tucked away at the back of a town or in large carparks. Sometimes they are even found in shopping centre carparks, like the large Intermarches. Mostly though, they are small areas either on the side of the road or nearby parks. They really need to be out of the way, especially if they have services attached. Trying to empty your waste in the middle of a town isn’t really something you want to be doing. 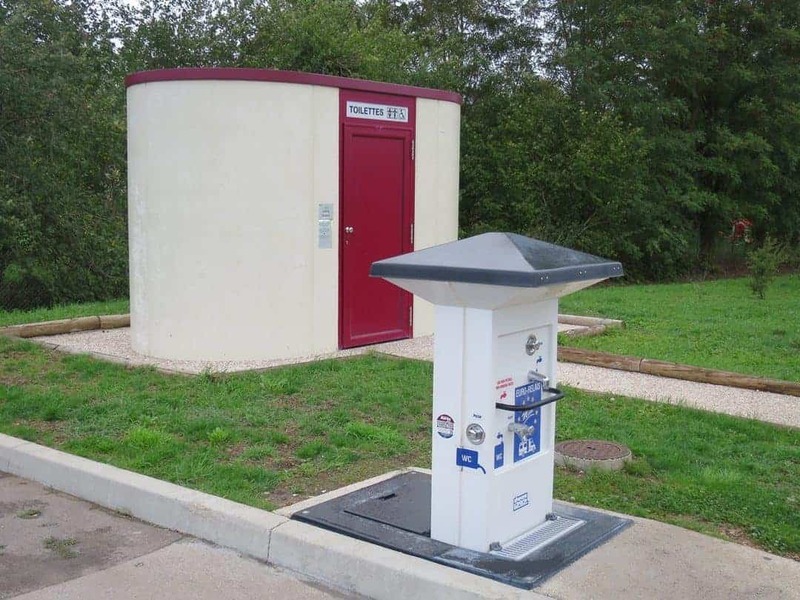 Service points will usually have a stand like the one in the image below where you can hook up to electricity and water. Generally, they don’t allow overnight stopovers. Sometimes, they even have toilet facilities which should be viewed as a bonus. Service point at an overnight stopover point in Gron, France. Free campervans stops in France. These areas are usually slightly larger and have dedicated overnight parking areas for vehicles. Aires are available on a “first in first served” basis. They cannot be booked and in peak season, they have huge demand placed on them. They are simply a matter of finding them and parking up in an approved spot. This is important as sometimes they are adjacent to, or in public carparks. Aires can be large dedicated areas for motorhomes and campervans, or they can be a few carparks set aside for this purpose. The larger ones, with more services, usually increases the chance of them requiring payment. Tip: If you are heading to a larger city, aim to get there mid-morning, just as those from the previous night are leaving. That way you’ll be more likely to secure a spot for the night. It can then be your parking spot for the day. We always have bikes so even if the aire is out of town you still have easy access. Aires are generally free to stay overnight, but there are some exceptions. In Bruges (Belgium) we stayed at an aire that was €24 overnight (including full use of services). Mostly, however, they only charge a minimum amount for use of services and the actual stopover is free. eg €2 per hour of electricity or 100 litres of water is a standard charge. Tip: In France, many of the aires rely on tokens to operate the service points. These tokens can only be purchased from such places as the local town hall or tourism offices. It also differs from town to town. It’s the one downside of this service and can be really annoying if you arrive during lunchtime or after hours. The new aires are starting to adopt credit card technology which makes for a much more efficient process. Our campervan hire company kindly provides us with a guide listing all the aires throughout France. It’s in French though so it can sometimes get a little tricky. Having a GPS is also essential for finding some of them. They are not always out in the open or well signed. The internet is also a great resource in any country for finding aires and downloading aires maps. We found we got very good at spotting signage as well, although this is more random. Note: You should always keep your safety and security as a priority. Use your common sense when choosing a location, especially during off-peak periods when you may be camping on your own. All the Aires book is available from Vicarious Media. Park4night is also a great app to use if you have a smartphone or on this website. Don’t park for long periods of time in the servicing areas. There is nothing more annoying than pulling up to get an hour of electricity to find that a campervan has been permanently parked in the servicing area. Staying at an aire means you must remain self-contained and take everything with you. If there are no waste disposal units, don’t just throw your waste out here. Clean up after yourself. Nothing is more revolting than having to deal with someone else’s waste. It’s not hygienic and it’s definitely not cool. France, and indeed Europe provides such a welcoming environment for travellers. There are so many free motorhome and campervan stops in France. In association with the France Passion network, travellers can save a considerable amount of money by using this type of service. There’s not much that comes for free, or for a few euros a night anymore, and I for one will always make the most of them. Remember to mention Beer and Croissants when getting your quote from France Motorhome Hire for €50 off your next hire! For all the latest tips, advice and hints for how to make the most of a motorhome trip through Europe, we've got you covered. Plus we've got some amazing short and long-term itineraries, videos and amazing photos to make you want to go on a road trip right now. Looking for the best motorhome home company in France. We recommend France Motorhome Hire and you can save €50 off your next hire when you meantion us. Follow our simple tips for keeping you and your motorhome safe when you hire one in Europe. Follow these simple tips before you hire your motorhome. They could save you time, stress and most of all, money. If you've never hired a motorhome before it can be hard to know what they look like inside. Read our guide which shows you the room your can expect, storage space, bedroom configuration, size of bathroom and more. This is a great idea driving in an RV around France. Do they come out as cheaper? There’s some very useful information here. I’m curious to know how caravanning in France compares to caravanning in Australia, both price wise and also ease of getting around. Personally Christina, I find the Euro countries and people far more welcoming than in Australia (and I’m Australian). As for price, it really depends on length of time, type of vehicle etc. There are less free places to stay in Oz which makes a real difference to Europe. This is an innovative concept that will encourage camping. A great way to explore France at your own pace. Oh I want to do a camper van trip! That looks like so much fun! Wow, this is great to know. I never heard of these before but will keep them in mind next time we travel. I think its great that Europe makes traveling by campervan affordable and accessible. I don’t think I’ve ever seen on in Singapore. We love traveling in camper vans! That’s nice that you can find cheap places to stop in France. The Aires de Service look great and convenient–even though the view is lacking sometimes you just need convenience at a great price! 🙂 Would love to take a camper van trip around France sometime! Never had a campervan experience as they not popular in the countries that I visited yet. However, this is a great idea for a more than a week-long trips. Nice to know about this alternate mode of vacationing. Thanks for stopping by, they are definitely great in the US, Europe, NZ and Australia. This will be a dream vacation inEurope with a campervan style of moving around. This is such great, useful information. Thank you so much for this! Love these tips on using a camper in France. I would love to do this there and Germany. Nice to know they are very accommdating of campers and some things are free. Its definitely popular in the US. Totally new to this concept. I dig and feel 24 Euros is a fair rate for those non free spots. We just finished an 80 day road trip across the states and ran across a few similar places here and thought, “what a wonderful gesture for travelers.” We had no idea they existed here, usually in small towns as well. I’m so excited to hear Europe has similar areas. We will keep it in mind for future travels! My brother in law travels around France in a RV. It’s good to read about the aires that he talks about so often. It’s interesting how different the RV experience is in the U.S vs. France. Interesting read, thank you! I’ve definitely seen these spots whenever I go on a road trip around Europe. It’s great to have learned the name for it now 😀 For sure, if I were to own an RV, these things are what I’d be thankful for since they’re super helpful. I would love to travel like this around Europe! It’s so cool that most places you can spend the night for free or very cheap. Yes I agree which is why I try to do both. As a campervanner, this is the type of info I used to search for. I was in France last weekend and saw these campervans heading north to the Normandy area. How fun that I would come across your post and learn more about the places in France where they hook up. This is a nice informative post that I really enjoyed. It’s great to know that there are these free places to stop over legally and with basic facilities. You don’t always want to spend money on a quick stop. I really miss my camper-van though and reading your recent posts makes me really wish I hadn’t given it up! This is such a great idea. I wish they did this in Scotland, especially in the small villages. Maybe they will now we have so many car electric charging points! I had no idea these areas existed! We often talk about potentially doing a road trip with a campervan, but it seems so complicated (and expensive) to find places to park overnight. Good to know there are some options out there. There are definitely plenty of places to do it without paying. I think I should really try traveling this way. I haven’t tried moving around in a campervan, but I might try when I travel to Australia next. These stops in France looks nice and affordable as well. I agree with your rules out there – some people really just don’t care about how the others would feel when they throw their waste anywhere or stayed for so long. Such irresponsible travelers!